Lume 1 is a 2U CubeSat developed for the FIRE-RS projectjointly by the Universidade de Vigo (prime contractor), the Centre National de la Recherche Scientifique and the Universidade de Porto, to assist the fightig of wildfires. The objective off the FIRE-RS system is to provide the Lume 1 satellite to receive wildfire alerts from terrestrial sensors. The satellite then transmits these alerts toa ground segment, which then sends UAVs directed to the position of the wildfire. The UAV will then be able to upload its data to the Lume 1 satellite to relay it to the ground station. 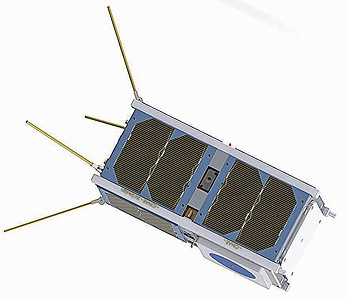 The payload of Lume 1 consists of the TOTEM Software Defined Radio UHF M2M Payload and S-Band transmitter and the HUMPL Humsat System Payload, also a UHF M2M Receiver. University of Vigo: FIRE-RS Project A Nanosatellite & UAVs hybrid system for wildfire characterization.